A bit more jazz- and pop-oriented than some of his later sessions, with covers of "Yesterday," "The Shadow of Your Smile," "And I Love Her," "Walk On By," and "Goldfinger." 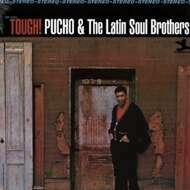 However, when Pucho decides to pull out the funky grooves -- as he does on "Cantaloupe Island," "Vietnam Mambo," and "Strange Thing Mambo" -- he and the Latin Soul Brothers can smoke. Even at its slightest, this is decent mood music. At its best, it's significantly more than that.